Hmmm, it seems that the Mid-Atlantic Effect (MAE) is starting to rear its ugly head for the next Wednesday/Thursday time period. For those who are not familiar with the MAE, it is a 3 phase process: 1) there is plenty of cold air around for snow but there is no moisture available, 2) a storm approaches and the air warms so rain, not snow, falls, 3) the storm leaves, thus taking the moisture with it, and it gets cold enough for snow again, but of course it doesn't snow because there is no moisture available. As Anonymous said a couple of days ago in regards to the lack of November snow this season in the TC, I hope this isn't a harbinger of things to come. Let's keep our fingers crossed, fellow snow lovers! Paul Douglas says December rain. December rain = Vikings tie or like kissing your sister. The biggest problem with this is someone saw the newscast in a restaurant with no sound and is now telling their co-workers "WCCO said we're getting 7 inches of snow". Exactly! 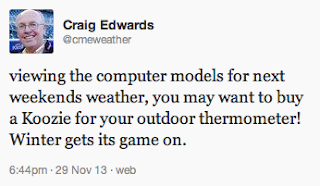 I would even be okay with them saying "some models disagree with me and predict more, but I think 3 inches is right." Just don't show the model on the map! Humans are far more visual than they are auditory. What really irks me about this is the fact that it causes confusion when people chat about it. One person may be listening from one room, and hear the forecaster say that there will be three inches. Another person may, as stated above, be in a restaurant with the sound off and see that we will get seven inches. Put these two people together, and they may start to argue about which forecast is correct, and cause each other confusion. I think we should believe what the person SAYS, because that is what the forecaster thinks will happen, but, humans are not necessarily going to go by what they hear. It would be a different story if the forecaster says that the model that they are showing is overly aggressive, and then state the lower total, but if they don't say anything, the model better be pretty close to what they say, or they should not show it at all. Mets often say that the public gets their forecasts confused. This doesn't help in that process. It's like presenting at a conference or so and showing one thing on the ppt slides, and tell the audience something different or almost opposite. Minnesota Forecaster I think you should start a much stronger and visible campaign about this. These people do not realize they are exposing themselves to ridicule. Before everyone goes over the deep end, remember that these outlets have a agreement with what ever company supplies them with their in house model. So the next question to ask are they required to use them in their visual graphics by contract? I don't know the answer to that, but I can't think of any other reason that a local met would not show the graphic they are most comfortable with. In that case they need to retake their class on journalistic integrity. News outlets should be ashamed of themselves if that's how they operate their weather departments. Since the name of the visual graphics don't appear to the viewer -- and wouldn't mean anything if they did, anyway -- it wouldn't seem like they're required to use anything. Here's an excerpt of comments made by DDWx from a previous post (some of you may have seen it). They may have some applicability to this discussion. "The snow meters are the derived model outputs and those decimal settings ARE controllable by the meteorologist using them. The software has settings you can control -- units, decimal points, range, etc. The perception of precision is the thought behind it and is pretty silly with the meteorologists' all knowing this, but it "looks good" to the director/GM at the station. Showing models on-air is a recent trend due to software improvements of tv graphics systems. Several reasons used: easy to create as no hand drawing, allows multiple graphics, and that 'precision' mode where the kinks and imperfections in a contour is believed. It is a crutch and can become lazy tv meteorology especially at a local market if no time/short-staffed to draw up the maps." Jeez people, enough already you think you beat the dead horse already? How is what WCCO did any different then what The National Weather Service graphic currently has up, they are calling for 5-10 inches of snow just north of MSP without even an advisory or watch, look around no one really has a handle on this storm. This event is definitely making meteorologists scratch their heads to what exactly is going to happen and where and when. Models are guidance not the gospel and should never be considered as such. When they all disagree (which they have been doing) then it comes to a meteorologist's experience and truly understanding the models and their biases, and making a consensus forecast with probability factored in. Anyway --- as Bill posted my previous comment regarding usage of model data on-air, it can be confusing showing model data which disagrees with verbal or other information given by a media, private or NWS forecaster. I am not 100% on the contractual obligations by a weather vendor to a local tv station, but knew at my station there was no such requirement to show a specific model output graphic. Just simply the option to use the variety of data available from several weather forecast models. Output IS controllable regarding precision in the software UI or in the background setting files. In WCCO's defense, tonight the weathercaster showed a looped snowfall QPF forecast that more agreed with their text and verbal information provided. The NWS graphics do show the potential for snow N of the metro but plenty of uncertainty and even stated in their fcst disco that not enough confidence to issue any long-fuse products (i.e. Winter Storm Watch, Winter Wx Advisories, etc). I can live with that as they didn't put significant snow fall amount in the metro despite one model that was doing so as they didn't have confidence in that guidance output. A suggestion is try to incorporate data on these maps in these situs to including areas outside of their county-warning-area (CWA) as anyone looking at the graphics would think nothing is going on farther north in the Duluth and Fargo/Grand Forks CWA's where much more snow is to occur. That would better help explain the long-fuse products issued by Duluth and Grand Forks NWS offices across northern Minnesota where there definitely is more confidence to what is expected to occur. @DDwx I disagree with part of your assessment on the NWS graphic. That graphic was put out at 8:22pm last night(since been updated this AM)which indicated snowfall of 5-10 inches just north of the metro(which included parts of Anoka county) for the Mon-Wed timeframe with no advisory or watch, yes I also read their discussion. and agree that their confidence was low with regards to how the upcoming event was to unfold. But here is where the disservice is made, if.confidence is low then why put. out that graphic and since the graphic was put out.why not use question marks after the totals to express the possibility that those numbers could be reached but confidence is low at this time....what I'm getting at is people made the arguement earlier that were a visual society and what happens when you just see a graphic and don't hear the audio or in this case dont read the NWS discussion for our CWA, you presume 5-10 of snow is coming and then your wondering if your weatherwise why there's no headlines in place like an advisory or watch. What also happens is other people use the NWS graphic to make a point or statement without the discussion attached to it, case in point look at Bill`s twitter page currently it has the graphic in question(I've also seen others like MPR and Paul Douglas use NWS pages/graphic on their blog).....in ending what I look for is be more responsible with your graphics, NWS.....this isnt the first time! I don't disagree with your thoughts, Big Daddy. And it seems to me that this is no longer your father's National Weather Service. They seem to be producing snowfall estimates much earlier than they used to. We will be lucky to see 1 inch, if at all. I can see your argument Big Daddy and justified. Each NWS office is slightly different with various philosophies, BUT also can have differing demands of the public, emergency managers, etc. which I have seen differ considerably from market to market. Is there inconsistency between graphics and any long-fuse products issued -- yes. Is there a reason to still at least post the potential of something in a graphic form -- yes. I would ask the NWS directly to what/why as the reasoning is obviously there. Like Bill said, its not your father's NWS anymore and much of that due to pressures and desires for as much information as possible even if not terribly confident if it would verify. EMs in many markets including hurricane and other situs prefer this and they are a major partner of the NWS as they should be. Never an easy way to get the information across as there is no perfect way especially in a tough forecast with high uncertainty, but at same time high potential. Pushing the use of probabilities will be coming by the NWS but how will be the big question. More markets using the Integrated Warning Team (IWT) philosophy where stronger communication between NWS, EM and media weather is critical and the Twin Cities market is now becoming a believer in this -- but it takes time and there will always be varying output as we see when turning to all the various platforms and their forecasts for this storm. Meanwhile, light rain on the way approaching the western Twin Cities. Looking back at their graphic, the 5-10' was spread out over three days! With just 1-3" for today and tonight. An advisory would have been overkill. At least now the watch is for heavier snow over a shorter time frame tomorrow night and Wednesday. It looks like the Twin Cities metro is going to get hosed so far as snow is concerned. The far northern burbs and points north will get accumulating snow over the next 3 days while we stay mostly high and dry here. We will get the cold, but it sure doesn't appear that there will be any snow associated with it. What exactly does a precise snowfall forecast offer to the average consumer? In other words, how will your life be different if Local Weather Babe #1 predicts 7 inches and we get 3? I understand that some people alter travel plans based on forecasts, but if you're taking weather forecasts as gospel, then you have bigger problems. That school blizzard in 1888 that killed 235 children would never happen now. Look how far we've come -- we can't nail down to the millimeter how much snow will fall, but it's a lot better than nothing. Correct me if I'm wrong, but for big operations like school busing, they make the decision to close school when it becomes apparent that a significant amount of snow *has fallen. 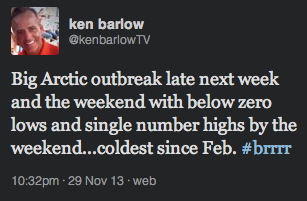 * I'm not aware of any schools that routine close based solely on a forecast. Certainly TV weather actors shoot themselves in the foot when they make boldly precise predictions and then contradict themselves. But like I said, does it really matter anyway? We here at this blog have enough experience with forecast models to take them with a metric tonne of road salt. You make good points. For city slickers, the question for me is just whether a storm will be a nuisance for traveling or something I'd be better to avoid if possible. For larger concerns, including school bussing, I imagine a heads up about a big storm could help them in their planning. For the most part, the exercise on this blog (my blog, so I can say this freely) doesn't have a ton of lasting import. But my goal has always been to put a spotlight on those who forecast well and those who don't. (And they provide fodder for analysis by providing snow estimates.) To which one can still legitimately say, "And so what?" The forecast keeps getting better for snow lovers up north. The NWS is now predicting 12+ inches through Wednesday for everybody from about Hinckley on northward. Lucky dogs!! @DDwx....I live in the west metro and its actually snowing, not raining like you mentioned in your last comment....hopefully it stays snow. I see that. :) It was raining per obs data in Hutch and Litchfield but was wavering that is for sure. Ran errands and came out of the store and it flipped to the white stuff here in Burnsville area. Trying to keep up with the wx, but a surprise case of separation anxiety with my old Bassett hound in new place/state has taken all my energy (and patience) the past 24 hours. *I see a WS Watch now issued so at least things are maybe starting to come together though likely still some questions to specifics. Snowing steadily in Burnsville. It started about 10 minutes ago. Nothing is sticking yet. Big daddy, I'm with you in that I hope it stays snow. Unfortunately, the odds appear to be against us. PWL, start dancing to bring the storm further south for us! Snow increasing in intensity here in Golden Valley.....coating in spots on lawn and various other spots....nice to see moisture,especially in the form of snow, hope it lasts! Moderate snow with big fat flakes. Parking lots, ground, roofs, cars, etc. all covered. Located 5 minutes from Minneapolis International Airport. The Weather Prediction Center is proceeding with a non US model forecast for snowfall probabilities. The will be using the UKMET/Global GEM/ECMWF solutions weighted towards the ECMWF. By Wednesday night we could see enough snow to plow here in the metro. The GEM has been adamant in that solution for the last couple of days. If you go to the previous thread, the last post I gave the Gem about a 2 in 10 chance of verifying. Looks like I underestimated that solution. Absolutely wrong & misleading to talk about a weather graphic/model solution that you don't agree with. Not only is it a waste of valuable on air time, but it really is misleading for someone who is watching the broadcast with no audio. I'm a bit surprised at how much the NWS has discounted the U.S. models. Because of this, the BUST potential is sky high, esp. for those from MSP on south. For me, this Winter Storm still screams heavy snow for areas just north of the MSP metro. I have that funny feeling that the Rain/Snow line will be located right over southern MN including the metro. Draw a line from BRD to DLH and that is where I would place my bets for the heavy snow axis. As usual, potential sharp gradient in the snow totals from NW to SE across the Twin Cities. Surface low track from near DSM to GRB is nearly perfect for a widespread SW to NE heavy snow event across the heart of MN. could it be time for another video Tom and Bill? first of the winter season. A lot has changed in a few hours, I take it? Winter Storm Watch out of nowhere??? We got a quick 1/2-1 inch in about an hour thanks to the squall line that moved through. Got the kids all riled up and excited, made everything somewhat white. Ready for more! I know its only a Winter Storm Watch, and it can downgraded or upgraded by morning.....but reading around no one is really buying into the NWS thinking. Dave Dahl poo-pooes the potential for us and says heaviest snow goes north of metro with a rain/snow mix for us and if the changeover comes quicker we may have a few inches, Paul Huttner acknowledges the system is tracking abit further south but that heaviest goes north of metro, but did say we may have to raise metro totals if the trend continues and you already have Novak's remarks above about where he thinks the heavy snow will go and doesnt like the fact that the NWS is disregarding the American models. 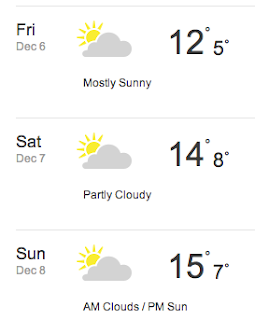 Weather.com also expects little to no snow in the metro. Kare 11 raised the potential of a couple inches slightly, but they barely even mentioned the watch in the news cast, focusing instead of the WWA and the northern half of the state. With all the uncertainty I decided to change gears and look at actual data --- out west. First I stared at a 24 hour water vapor loop for several minutes and compared to GFS/NAM/ECWMF/GEM initializations at 12z today for jet streaks and vorticity centers rolling. Then looked at the 500mb height falls and rate of change from 12z Sun to 12z today to see the trend and compare to water vapor and 300 mb jet stream trends. Consensus: the only model to pick up on the significant height falls (greater than 60 meters) was ---- the ECWMF and to lesser extent, the GEM. Interesting. Lets see what happens with tonights 00z model runs as the 12z NAM and more so the GFS slowly trended toward ECWMF/GEM solutions. *The hour-by-hour precision fcst loops used on-air by two stations is wx vendor WSI's RPM which is their version of the WRF which is heavily weighted by the NAM. Today's snow was missed badly by the NAM and GFS as their P type was mostly rain. Ooops. I must admit I'm lousy at reading water vapor images, however this morning It looked like more snow for us this afternoon as a jet streak was orientated nw to se over the Sioux Falls area. So just to be clear, let me ask a straight forward question, the ECMWF was the only model that came close to observed conditions? I saw that early this afternoon the dual pol radar was showing some rain coming into the metro, but it had a hard time reaching the ground, what it did do though is cool the column as my truck when running errands dropped quickly from 39 to 33°. Yes the NAM/GFS and most all of the short term high res models missed this snowfall as well. The Euro however had the 540 thickness line well south of the metro as well as the 850mb 0° temp line. Based on my quick study, the ECMWF was the closest to the actual data at 500mb/300mb levels for height lines/orientation as system dug a little deeper than GFS/NAM had forecast. This is a known bias that ECMWF is superior in for years. One thing to pull up a model on the internet, another thing to understand all the biases and comparison to actual data. I see the NAM and GFS 00z runs adjusted closer to ECWMF and GEM solutions thus it seems a little more confidence by meteorologists for the expected areas of snow for this event. With the jet stream & Jet streak oriented SW to NE from the Rockies into southeast MN late TUE into WED, I just can't see the heavy snow band setting up near and/or south of the MSP metro. However, as usual, there will be an extremely sharp NW to SE gradient to the snow & this gradient could easily set-up right over the metro. I'm still confident that the heaviest snow 12"+ will fall north of MSP over DLH, Brainerd, Spooner, etc. With that being said, I will not be surprised if some decent snow falls over the metro, especially over the northern sections. Confusing numbers on NWS. WSW for 6+ inches, but in their detailed section, it says 2-4 (for Hennepin County). Also, for kicks, I checked out the forecast for Thief River Falls and Brainerd earlier today and it was for 5-10 inches, which was interesting that even in light of all the hype of this storm "going north" for the past few days, the latest forecast technically has the same potential number for the metro and northern city areas (around 5 inches possible in both, just on the low end for one and the high end for the other). Always makes me think: no one really knows until it starts snowing do they? Me thinks are local mets will change their tune. I don't know...definitely a shift but that's still a pretty sharp cut-off N/S. It is only showing 1-3 inches very near the airport. Is the real question at this point when it changes over to all snow? The GEM Reg is in for 12/03/0z and this takes some work to figure out. First of all you may want to look at long and latt map to find 45° latitude north as it basically runs from golden valley to rosemount . Once you get a visual it will help with what I about to post. The map that I will post shows the snow water equivalent of what the GEM REG (a high resolution 48hr model) depicts in mm. Then you have to convert that to inches. I'm using 23mm that would equate to about 9/10ths of a inch, at a ratio of 10:1 that would be close to 9" over the northern burbs. Kare 11 is holding form on 1-2 inches through Wednesday. If anything, they've actually backed off potential for more that they were showing earlier. WCCO agrees, forecasting very little accumulation through Wednesday night, but they acknowledge the potential for a change in the forecast as the storm develops. Dave Dahl sees little to nothing until late afternoon tomorrow, rain east, mix west. He sees a dividing line along Wright/Hennepin counties much of the afternoon. He calls for a blanket 3-5 inches total throughout the metro based on the latest track. He also mentions the snow potential for Sunday. I won't be surprised to hear of storm total accumulations of 18"+ when all is said and done in the DLH, BRD, Spooner WI, areas by WED pm. They have already received 5"-8"+ this evening. NWS is calling for at least 3-6 inches in the advisory area (6-9 inches in the warning area). Kare 11 meanwhile is calling for up to an inch through Wednesday night in Lakeville and Burnsville, which is on the demarcation line between the advisory and warning areas. Really? Why is Kare always so ultra conservative with snow and cold forecasts?